Jordan Johnson and Robert Green stand outside of the food truck they had city approval to open for business. Bureaucratic miscommunication forced the Overbrook Park entrepreneurs to close after just six days of operation. They are seeking to reopen. Robert Green and Jordan Johnson, co-owners of a barbershop in the city’s Overbrook Park neighborhood, wanted to expand their business in an unexpected fashion. They opened Hairitage Barbershop at the corner of Drexel Road and Haverford Avenue in 2014. It’s an established business, and one that lets the business partners give back to the neighborhood where Green’s lived for decades. At 31 and 28 years old, respectively, they claim to be the youngest black business owners in the neighborhood. When an opportunity arose several months ago to buy – and soup up – a food truck with a mobile license, the millennial entrepreneurs pooled enough money to buy it. The vehicle needed work, so they repainted and revived it. Their business and marketing plans were built upon the premise of keeping it right outside the barbershop, and branching out into festivals and block parties when opportunities arose. It’s a restaurant-scarce area, so barbershop customers and neighbors were their target audiences. Fast forward to last month. Green and Johnson say they spent many hours and a lot of money to obtain the proper business licensing and permits. The city's Department of Licensing and Inspection gave its approval on April 25. Things were looking good for the first few days, but then something happened that’s left them seeking help from supporters and elected officials. On the sixth day of business at the Platters food truck, an L&I inspector showed up with a laptop. The department said it had to shut down the entrepreneurs due to amendments to a City Council ordinance that rendered the location unfit for food trucks. It’s a half-mile stretch, and the truck would be one-tenth of a mile from its boundaries. The L&I inspector's visit came one day after Mayor James Kenney signed it into law. And that – inexplicably seeing their brand expansion plan put on hold – is what the men spent some time talking about to PhillyVoice inside the barbershop on Tuesday. Green has lived in the Overbrook Park neighborhood for 20 years. His father owned Rob’s Barbershop just a block away from 2001 until he passed away in 2009. Opening a shop of his own wasn’t about piggybacking on the legacy of a father beloved here for, among other things, hosting Bible Study at his barbershop on Tuesday nights. For Green, it was about establishing himself as a businessman on his own merits. Teaming up with Johnson – who worked at the other barbershop – was a natural outgrowth of entrepreneurial spirit, said Green, a Penn State University graduate who’s enrolled in a master of arts in education program online. 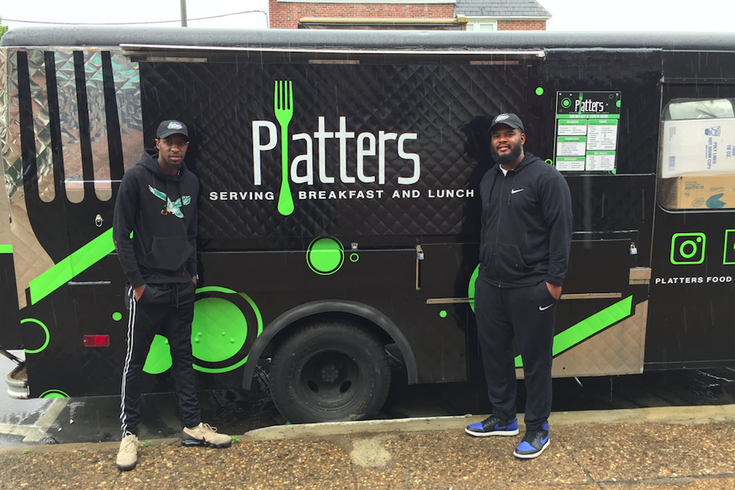 Business partners Jordan Johnson and Robert Green seized the opportunity to buy a food truck in an effort to expand their brand beyond the barbershop they opened four years ago. 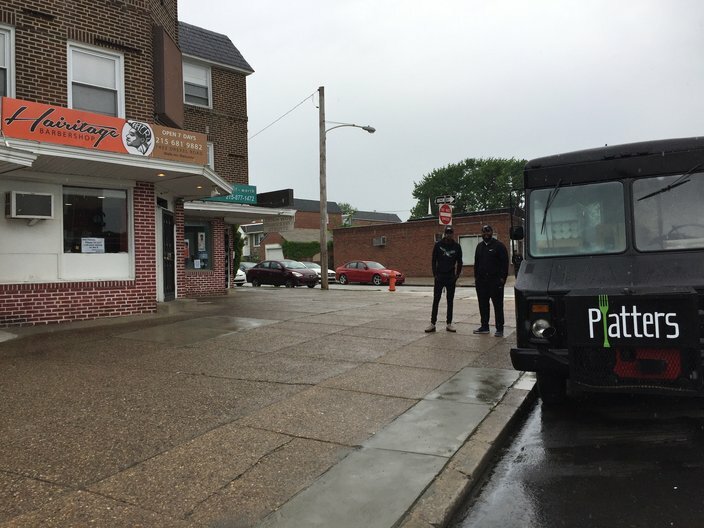 The businessmen said getting the support of neighbors (which they have) along with the online petition would help soothe any concerns that their food truck isn’t good for the neighborhood. This, despite two recent – and misguided – 911 calls claiming there was a fight near the truck when, in fact, nothing of the sort had happened. This confounded the entrepreneurs, who performed due diligence with community leaders, the police-district captain and organizations like Town Watch. In the opening days, the food was a hit at the truck, opening at 7 a.m. to serve breakfast and closing around 8 p.m.
“If people just don’t want a truck in the neighborhood, I’m cool with that,” he said. “But calls to police saying people are fighting at the truck? And calling police when we’re just out talking to neighbors? I’m not cool with that. Johnson said the experience – and a visit to a City Council meeting last week – opened his eyes to things that deserved his attention earlier. They’ll get to do just that on Thursday, as Jones has convened a meeting “with all interested parties,” according to Josh Cohen, his chief of staff. UPDATE: Several hours after this story was published, L&I responded to an earlier request for comment. Department spokeswoman Karen Guss said the truck "still has valid licenses and can operate anywhere in Philadelphia that is not expressly restricted." "The Platters operators’ license was not a license to vend right outside of their barber shop. The license was not for any one location," she said, noting that there is some level of community opposition to the truck. "There would have been no reason for L&I to know that that specific location is what those guys had in mind."